"Rather, it begins to appear that there once was a (roughly speaking) western-eastern-southern distribution of the G/R1/J2 lineages in the territory of West Asia; this would be compatible with both the Neolithic European G dominance, the paucity of G in Central/South Asia, and its NW/S vs. NE Caucasus differentiation." Would you please explain your actual picture of the western-eastern-southern distribution of G/R1/J2 better? Thanks for your continous energy in providing news! In Excel file they have 0% of G1a in Ashkenazi jews, which is incorrect. in FTDNA we see 2 major G1a clades - Ashkenazi and Kazakh. Just what the doctor ordered! Although I wonder if the resolution could still be better. Concerning the presence of hg G in the Caucasus, one of its distinguishing features is lower haplogroup diversity in numerous populations (Supplementary Table S1) compared with Anatolia and Armenia, implying that hg G is intrusive in the Caucasus rather than autochthonous. Good to finally see this stated in a paper. This has been somewhat obvious for a while (and I have stated as much), but needed sound sampling. At any rate, it has been evident that due to its geography and history, the Caucasus has been a sink - not a source - of haplogroups that may be rare today in other places. Why is Hap G associated with the spread of agriculture ? It is interesting that they say that G was intrusive into the Caucusus, instead of originating there. Time and again, we accept and recognize that isolated refuge spots (islands and especially mountains) are places where people flee too and/or places where they remain isolated. As opposed to population centers from which a outward expansion originates. It would make sense that the Caucasus are such a refuge, instead of a source. I have said for quite some time that G was probably one of the earliest European Hgs. I believe it was driven almost entirely out of Western Europe, instead of originating in the Caucasus and expanding into Western Europe. The Ancient DNA seems to support this: that G was once far more widespread in Europe. So J2a and more likely J2a may be associated with the southern areas of West Asia as compared to the western or eastern regions during the Neolithic? I know we need ancient samples from West Asia and the Near East to prove this but it is interesting speculation still. Which West Asian Neolithic cultures may J2a be associated with do you think? "Although no basal G-M201* chromosomes were detected in our data set, the homeland of this haplogroup has been estimated to be somewhere nearby eastern Anatolia, Armenia or western Iran, the only areas characterized by the co-presence of deep basal branches as well as the occurrence of high sub-haplogroup diversity". And G is a basal F-derived haplogroup. "to highs of 0.88 in Azeris (Iran) and 0.89 in eastern Anatolia and 0.90 in Armenia. We estimate that the geographic origin of hg G plausibly locates somewhere nearby eastern Anatolia, Armenia or western Iran". So presumably F passed through, or somewhere near, that region before entering South Asia. "but then decreases rapidly toward southern and Central Asia". And presumably its presence there is a result of later movement into the region, not indicative of G's region of origin. So what happens now to all those who have insisted that Y-DNA F coalesced in South Asia? "Rather, it begins to appear that there once was a (roughly speaking) western-eastern-southern distribution of the G/R1/J2 lineages in the territory of West Asia"
But they are each pretty much anciently separated haplogroups. G is a basal branch within F, R1 is a downstream branch of MNOPS and J2 is a downstream branch of P. Any combination would be an accident of history and immigration, not a product of collective origin. I agree that all three are probably associated with the spread of agriculture into Europe. IMO this data puts the origin of G (M201) in Georgia, the eastern Black sea. G2a1 (P16) sub-branch Stayed home in Georgia. Presumably G2a3 also stayed home in Georgia although there is no data. G2a3b (P303) is the Russian sub-branch that is shifted slightly north of Georgia on the north north eastern Black Sea. G2a3b1a (U1) stayed home in the NNE Black sea area (Russia). Brother clade G2a3b1c (L497) seems to have lept from NNE Black Sea (Russia) to Constanta, Romania and Marseille, France before radiating out. It looks like maritime connections although I suppose a smudged river connection between Romania and France is possible. Otzi (Iceman) is G2a2b (aka G2a4) so this really does not tell us much about him, except his cousins might have had boat routes through to places like nearby Marseille, France. His closest cousin (P16) is still focussed on Georgia and he does not belong to either the Turkish or the Russian branch. My best guess is that his haplogroup had the same routes available to him as his Russian cousins but that his haplogroup (G2a2) departed from Georgia. Looking at M201; this broadly is similar to the pattern observed for some fo teh sub-groups of J2 (? M92)- ie the apparent local peaks in Caucasus and Italian Peninsula. Terry, the data are still highly compatible with the reverse direction - i.e., back-migration of a number of haplogoups (F, H, IJ, L, T) from somewhere like Pakistan, where they were the ones "left behind" versus the huge groups expanding farther east in India, SE and E Asia. 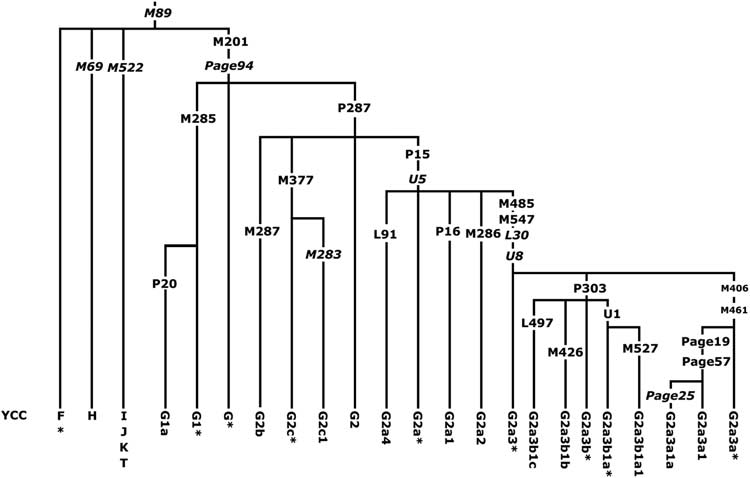 As to the paper, while M497 may be the primary haplogroup characteristic of LBK, to me it looks like much below P15, and in particular M485, contributed in the agricultural expansion in Europe (Cardium included). What is important to find out is which of these groups may have had a presence in the Balkans or in Greece before the agriculturalists arrived. Why would you say that? (column "D" in the spreadsheet is G M201-all - a sum of all Gs - not M201, which is the next column). Georgia has largely highly-derived subgroups such as P16, U1, and G-P.19. And P15 is shared almost all over Europe and Turkey and Iran. As I have said many times, Georgia, as the remainder of the Caucasus, is definitely not a source of G nor of any major G subgroup. G distribution is spotty then how can it is possible to link with Agriculture spread? Caucasus G2 presence is more like late adaptation of agriculture into tribal society. If there is agriculture in society you can see population clusters like O3 or R1a. Linking Agriculture in Western Eurasia with either G or J2 or with Fertile crescent is pure favoritism. highlighting BMAC and ignoring Indus valley is another of these ideas which are separated by 100 miles. there will be 1000 papers submitted on these theories with pure favoritism. There is 7000 BC year mud brick structure and agriculture proof in Mehergarh. Agriculture , mud , bricks can not originate in mountains . "It would make sense that the Caucasus are such a refuge, instead of a source." This is clearly the case on the linguistic side. Ossetian and Armenian are obvious examples - IE languages that came in from opposite directions - but they are obvious to us because those movements are in the historical record. It may well be the same with the Kartvelian group. We just don't know. This may also explain why Northwest and Northeast Caucasian are so hard to put into one ancestral family - they don't have a common ancestor. As a post here alluded to, NW Caucasian may in fact be what is left of a group of languages that covered a lot of the Pontic steppe rather than the source of that group. "Time and again, we accept and recognize that isolated refuge spots (islands and especially mountains) are places where people flee too and/or places where they remain isolated." Indeed, one wonders if all of the hgs that look sourced in Eastern Anatolia, Armenia and the Zargos Mountains are themselves refugees from the Fertile Crescent where the source populations are no longer found at all. The dating evidence in the Supplementary Table is also interesting. For example some G haplogroups are much older in Sephardic Jews than Ashkenazi. I have to think about what that means. I could be very dramatic. Some interesting high dates for early G in Russia and Pakistan (high errors unfortunately). There is no G (M201) dated. G1 (M285) is dated at 20k, 15k in the Caucasus. G2a (P15) is 15.5k. ~14k in Caucasus, Corsica and Turkey. Older in Turkey (15.5k) than the Caucasus (13k). Younger in Europe but not by as much as I expected. 12k in Germany and Italy. 12k, older in Turkey than the Caucasus. No data on Pakistan. 12k, older in the Caucasus than Turkey. Odd high value for Pakistan with high error. An intriguing 10 k in Germany (3k error). Looks to me like G haplogroups arrived in Western Europe somewhere around 12kya from the Black Sea. Possibly as early as 14kya. I favour a maritime route. "Terry, the data are still highly compatible with the reverse direction - i.e., back-migration of a number of haplogoups (F, H, IJ, L, T) from somewhere like Pakistan, where they were the ones 'left behind' versus the huge groups expanding farther east in India, SE and E Asia". Possible, but if that were the case G obviously didn't do well in South Asia. And IJ's origin could hardly be convincingly placed in South Asia either. And we have F3 found closer to the Caucasus than to South Asia. I agree that F1, F4, H and LT look definitely South Asian though. But Y-DNA F's likely region of origin fits Dienekes idea of a time groups of humans spent round the Persian Gulf region before further expansion. "Why would you say that? (column "D" in the spreadsheet is G M201-all - a sum of all Gs - not M201"
Yup. A haplogroup originates at one point and moves out from that point mutating as it goes. Very little of the original haplogroup remains in time, sparsely spread across a very wide territory, potentially anywhere subclades managed to get to. It is useful to phase out subclades, and you may get clues to a populations source by looking at the pure original form, if only a subclade migrated (eg 1 person or family). But you can easily get misled if there has been a secondary expansion. I think the distribution of M201 (all) and the geographic distribution of its first generation of progeny give the best clues to the original source. The first mutations will occur on or around the source. G2a1 (P16) is also focussed around Georgia. G2a3a (M406) is just south of Georgia and G2a3b (P303) is just north. It fits with the logic. Occams Razor applies until we have something to substantial to grind against it. I guess we have to agree to disagree. Again, the subgroups you mention are highly derived - why not look at the ones closer to the original node? 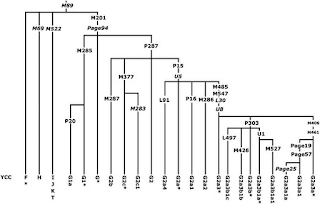 With your methodology, one may as well (wrongly) argue that Europe is the original source of G, since it has such diversity in the sons of P15 and M485. Why is it that a large number of G2a3a persons in the Levant have the value of 21 at (STR) marker DYS390, in an historical context? Religion is not an issue for me, but I stumbled across a few Palestinian Christians who likely belong to G2a3a. I got the impression that these men are the descendants of an ancient “Pagan” Population along the coastal lines of the Levant. From the maps, did anyone else notice the lack of Hg G in the Crimea? If theories are correct, the indigenous people of the Crimea, at the time of ancient Greek colonization, were related to the peoples of the adjacent NW Caucasus. Also, the absence of Hg G in the Ukraine, as noted in the article, raises questions concerning the "Cherkess" who appear to have lived in what is now the Ukraine in Medieval times. Were they real Cherkess, who suffered from population replacement, and are absent? Or was the ethnonym used for Circassians and for a differen population, the East Slavic-Iranic-Turkic population that contributed, in part, to the modern Ukrainians. I worked as close to the source as possible with what haplogroup data the paper actually had. Using frequency and STRs, avoiding STR diversity as much as reasonable, as I dont trust it. My conclusion on the data was that the source was most probably Georgia, not Europe. Having said that it looks like G has been in Europe for a long time(~12k). Pre European neolithic on these dates. If theories are correct, the indigenous people of the Crimea, at the time of ancient Greek colonization, were related to the peoples of the adjacent NW Caucasus. Which theories? The consensus view is that at the time of the ancient Greek colonization Crimea and its environs were mainly inhabited by Iranic peoples like Scythians, Sarmatians and Cimmerians (though Cimmerians may be Thracian-related rather than Iranic). What medieval Cherkess in what is now Ukraine are you referring to? The historical Cherkess (the word "Circassian" is just a Latin-based derivative of the word "Cherkess") country was in the the NW Caucasus, not in what is now Ukraine. The Cherkess (called by names like "Adyghe" and "Kabardey" among themselves) are one of the oldest extant ethnic groups of the Caucasus. "Yup. A haplogroup originates at one point and moves out from that point mutating as it goes. Very little of the original haplogroup remains in time, sparsely spread across a very wide territory, potentially anywhere subclades managed to get to". "It is useful to phase out subclades, and you may get clues to a populations source by looking at the pure original form, if only a subclade migrated (eg 1 person or family). But you can easily get misled if there has been a secondary expansion". That is certainly how I usually look at haplogroup distribution. Annie, Eurologist and TerryT - To take your points further. If you consider the history of migrations, back-migrations, invasions and colonizations, imagine how much there was in prehistory. If tens of thousands of Gallations can move from France to settle in central Anatolia, the opposite direction of supposed DNA flow, how can anyone determine from extant populations what their geographic source and migration routes were? What is needed is hundreds if not thousands of aDNA samples and then maybe a reasonable inference can be drawn. Onur, I said "theory" because the jury is still out on the ethnicity of the Tauri, they might have been related to the Cimmerians, they might have been related to NW Caucasus peoples. The absence of Hg G supports the consensus view you mentioned about the Tauri's ethnicity. But, as with any issue, it is not 100% certain. There could have been population replacement. Nice summary on the Cherkess, Onur, isn't wikipedia & google great! Why didn't you define "medieval" while you were at it? I used Cherkess and Circassian because I got tired of repetition. My bad if it was unclear. I hope most folks who would look at my post could deduce that I knew Cherkess=Circassian. The term "Cherkess/Cherkass" was used by Russians as an appellation for individuals from the Ukraine and Cossacks (Same difference, I guess) in the 16th & 17th century. Orest Subtelny, in his history of the Ukraine, touches on the subject but says it was obscure and merited more research. P. Longworth, in his work on the Cossacks, writes that the use of "Cherkess" for Cossacks was from the city Cherkassy/Cherkasy. I don't have my copy in front of me, and google in snippet view so I can see the footnotes, but I'd be interested to see what Russian historian he was basing that theory on. Perhaps Longworth is correct, but perhaps the settlement was named Cherkassy because some locals were already called Cherkas. Otherwise, why was a city in the central Ukraine called Cherkassy? The other conclusion would be that a group of Circassians actually settled in the area. Or, and I'm just guessing here, the town was so named to honor a military victory over Circassians. But that would be not typical of East Slavic place-names for that period, and correct me if I am wrong, are usually named after waterways or local peoples. The sharp divide between the NW Caucasus and Ukraine, as indicated in the blog post, certainly points to the use of cognate ethnonyms for different peoples. I don't blindly follow Wikipedia. In this case I used it only to check what I already knew and it was confirmatory with what I already knew. That is the most reasonable explanation in light of all the evidence. Also, use of the same appellation for different peoples is not something foreign to Slavs (see, for instance, the Cossack/Kazakh example). This is understandable when we take into account the fact that the words "Kazak" and "Cherkess" were appellations rather than ethnonyms until recent times and gained ethnic meaning only recently. "how can anyone determine from extant populations what their geographic source and migration routes were? What is needed is hundreds if not thousands of aDNA samples and then maybe a reasonable inference can be drawn"
In the case of F we have the rather interesting situation where one of its derived haplogroups (IJK) looks to peel off progressively from west to east. IJ tends to be SW Asian, LT in northwest South Asia and K(xLT) in the Far East. Basal F haplogroups can also easily be arranged in a continuous string from west to east, so the simplest explanation is that as F moved east its descendant haplogroup accompanied it. Especially when we consider that F ultimately comes from Africa so presumably its origin is likely to be somewhere nearby. Of course if you're going to postulate huge movements leaving no descendants behind it's possible to come up with any theory. "Occams Razor applies until we have something to substantial to grind against it." It looks like Georgia (or thereabouts) is the best fit at the moment IMO. "It looks like Georgia (or thereabouts) is the best fit at the moment IMO." Let's take a look at the upper nodes, once again. M285: wide-spread; Estonia, Russia, France, Near East, Turkey, and quite significant in Iran. Georgia? Absent. P287: Corsica, Sicily, Switzerland (=Cardium) and? Iran. Georgia? Absent. M377: Belorussia, Poland, Russia, Austria, Central Iberia, Ashkenazi Jews, Turkey, and? Iran, Kyrgiz, Pakistan. Georgia? Absent. P15: Poland, Russia, Iberia, France, Sardinia, Corsica, Sicily, Italy, Balkans, Crete, Greece (Cardium? ), Near East, Turkey, and? Iran. This one is also present in the Caucasus and in Georgia - but makes up less than 10% of G in Georgia. The main G in Georgia (70%) is in fact one out of 5 subgroups of this one, with the other 4 not present in Georgia. M485: Ukraine, Russia, Netherlands, Slovakia, Iberia, Sardinia, Balkans, Crete, Greece, Near East, and? Iran. Also a bit Caucasus - but Georgia? Absent. "We estimate that the geographic origin of hg G plausibly locates somewhere nearby eastern Anatolia, Armenia or western Iran". Armenian Highland, Russian Armyanskoye Nagorye, also spelled Arm’anskoje Nagor’e, mountainous region of Transcaucasia. It lies mainly in Turkey, occupies all of Armenia, and includes southern Georgia, western Azerbaijan, and northwestern Iran. When the Treaty of Lausanne was signed in 1923, the Republic of Turkey was established. It is claimed that in its attempts to Turkify the geographical and settlement names in Turkey, the authorities of the republic began a systematic campaign to alter non-Turkish placenames. These attempts included the name change of the geographical expression of "Armenia" or "Armenian plateau" to "Eastern Anatolia." However, as can be seen in Turkish sources, the names Armenian plateau (Ermenistan Platosu) or Armenian Highland (Ermenistan Yaylası) are used to define the plateau. The term "Eastern Anatolia Region" is designated for the region and is mainly used for statistical purposes, while geographic expression Armenian plateau is continued to be used in contemporary Turkish sources. Anatolia ends in the Euphrates (roughly speaking). Roughly speaking, east of the Euphrates begin the Armenian Highland in the north and Mesopotamia in the south. Why the name of the Turkish part of the Armenian Highland (Ermenistan Yaylası) was officially changed to Eastern Anatolia and why the name of the Turkish part of Mesopotamia was officially changed to Southeastern Anatolia (as if they are parts of Anatolia) by the Turkish Republic in the early decades of the Turkish Republic is entirely political. As you said, it is a result of the Turkish Republic policy of Turkification of geographical and settlement names in Turkey. In the last ten years with the increasing democratization of Turkey a reverse trend has begun in Turkey. Now there are talks about restoring the original place names among the politicians as well as the public. Which data are you looking at? I am not see in it in this paper. Is it total SNP or pure forms (with no other mutations)? Was Georgia tested? It is often lumped in with other things. I know G1 STRs are supposed to be high in Iran (Wikipedia), but I cant find the source of this info. Also the root STR G1 data is very weak. G1a (Ashkenazi, so who knows), G1b (1 Sri Lankan), G1c is unknown. G2a (looks Georgian focussed as I have said), G2b (1 Turkish guy, probably recently mutated), G2c is mostly Ashkenazi so who knows where it came from. All so very weak. I am going off just the SNP frequencies in this paper, specifically G2a1 (P16), G2a3a (M406)and G2a3b (P303), as I dont have anything else to chew. Iran and East of Turkey are close enough to be still possible with more SNP detail. But at the moment Georgia is the best fit. Which data are you looking at? Annie, I am looking at supplement ejhg201286x4.xls . There is no other supporting document to this paper of relevance, in this context. This same document also tells you that mathematically, Georgia has one of the lowest haplogroup diversities of the regions studied - which should be clear from what I posted, anyway. To be blunt, I am not sure how you feel you can even comment on this paper without looking at this supplement. At least, now I know why your comments have made no sense, whatsoever. Let's not get carried away, here. G is one of the oldest haplogroups out there - and may very well be older than 60,000 years, given its standing in the tree. But clearly, it survived some place at very small numbers compared to other sons of F (and thus bears similarities to IJ and LT). To me, the most likely place of origin is the NW subcontinent - parts of Pakistan with a moderate climate and sufficient rainfall throughout many tens of thousands of years. G-carriers then back-migrated, probably before LGM, and spread around the southern and western part of the Black Sea just after. Finally, the beginning of agriculture was an opportunity for this haplogroup to expand further into Europe via the Balkans, and also perhaps via the Caucasus, and also led to renewed expansion eastward. In the last ten years with the increasing democratization of Turkey a reverse trend has begun in Turkey. Now there are talks about restoring the original place names among the politicians as well as the public. Another point: southeastern Turkey is traditionally called Kurdistan. This explains why the early authorities of the Turkish Republic especially felt the need to include it in Anatolia by changing its name to Southeastern Anatolia. BTW, Anatolia proper is traditionally also called Rum (=Rome), a name which the early authorities of the Turkish Republic also tried to remove from memories. That statement is OT - but for most outsiders with intimate connections, or insiders with an unbroken outside voice, it seems to me such people conclude the absolute opposite is the case. My own judgement is that under its questionable leadership, democracy has been failing in Turkey over the past several years - and it is no longer a country I would consider democratic from its political set-up, structure, and every-day reality of violent suppression of any form of opposition. "Indeed, one wonders if all of the hgs that look sourced in Eastern Anatolia, Armenia and the Zargos Mountains are themselves refugees from the Fertile Crescent where the source populations are no longer found at all." Why refugees when all the previous genetic studies have shown them as natives of the Armenian Highlands which encompasses more than today's Armenia (which is just a result of the previous century), before that Armenians lived on the vast lands of the Armenian Highlands. "To me, the most likely place of origin is the NW subcontinent - parts of Pakistan"
I respect your opinion but myself will go with the article which has confirmed high diversity of G hp in Armenians which we already knew. "haplogroup diversity spanned from a low of 0.21 in Adyghes, to highs of 0.88 in Azeris (Iran) and 0.89 in eastern Anatolia and 0.90 in Armenia". "We estimate that the geographic origin of hg G plausibly locates somewhere nearby eastern Anatolia, Armenia or western Iran. " Eurologist, as this is no place for discussing democracy in Turkey, I'll be very brief. Today in Turkey people can speak and write much more freely than was the case 10 years ago. I can never claim that democracy in Turkey has reached the Western standards, but to say that it has been failing over the past several years would point to a gross misunderstanding of the situation in Turkey on your part. I am saying these as a non-supporter of AKP (the ruling party). I don't even vote in elections. "Let's not get carried away, here. G is one of the oldest haplogroups out there - and may very well be older than 60,000 years"
Onur, _all_ naming is a function of power. Power is good, weakness is bad. Turks should never apologise for asserting their will to power nor should anyone else. Thats how every country got its own homeland, thats how every species survives. We might as well say that most of human history should never have happened and that nations and cultures should never have existed because it wasnt "democratic". Thats gives you an idea of where democracy is headed. England should never have existed according to this and our nation should never have been born. We never should have had our Empire and the foundation never should have been layed for the accumulation of capital and the industrial revolution that democracy has depended on anyway. Democracy is a very recent phonemomon in Europe, I wouldnt fetishise it. Like you said before, "history has no direction", its not as if democracy is somehow the pinnacle of human history. Thats a liberal fantasy. Its a kind of ideological imperialism, that everyone has to copy Europe in order to be valid. Its so short sighted; we are always "right": it was the same when we were christian, we were the "only true" ideology and the rest were heathen and in any case damned. Democracy is a central plank of the new religion and it represents a weakening of the will of a nation. Democracy indicates a loss of racial vigour and the twilight years of a people. Look at Britain, we ruled the waves for centuries and we have lost almost everything since we gave the vote to women and to the lower classes, even our own homeland. Britain is rich because of how we exploited our Empire not because of democracy. Apart from technology our culture has plummeted to the depths over the last century. The people dress like tramps and we have no musical or artistic culture to speak of, let alone philosophy. None of the great civilizing empires of the past were democratic. I had to laugh these days when the British media holds up Greece as the "home of democracy". Greece was aristocratic and slave based, so was Rome. Democracy was a short lived aberration amongst Greeks who showed a creative awareness of divers political systems. The British media is simply _lying_ and that is the level that democracy functions at, silly lies and illusions for the soppy masses. The same would be true in Turkey, democracy will just lead to the dissolution of the Turkish nation. Democracy will divide a solid nation into a million different factions and interest groups. Why would you want to "democratise" anyway, so that you can join the EU, which is collapsing after a single decade? Dont waste your time with that. Everyone has their own homeland, Turkey, Greece, Armenia and everyone should be grateful for that. No one has a "right" to anything, we have what our ancestors took and that is how nature works. If there is one thing that I cannot stand it is the attempt to use weakness as propaganda, it is obscene and shameless. Those who lose should not use their loss as an argument for entitlement, its totally unnatural and unhealthy, sickly. It is the mentality of the slave. Gain comes through strength and wisdom not through whining. Humanity would be reduced to one huge sickly whine, which is how the democratic media seems to want things. I say no to that. Human history advances through what is noble and strong and we exist only to the degree that we participate in that. We should never apologise for our existence - unless we are truiy sick unto death. "lost almost everything since we gave the vote to women and to the lower classes, even our own homeland"
We recovered from being one of the poorest nations in Europe only we put Elizabeth I on the throne. She also the first to "rule the waves". We got rich by being bold and creative (if not particularly ethical). And by listening, instead of just imposing the will of an out of control idiot ego. The British empire reached its peak of power under Victoria. Another woman. We fell when when lost all our money in World Wars I and II (under Kings), although it could be argued that the rot set in much earlier. The bold and creative leaders had been replaced by the complacent and profligate, riding on the backs of the folk actually doing the work. The wars revealed clearly to the working class just how incompetent, inbred and unworthy our ruling classes had become. Similarly women fought for the vote because the vote because their efforts during the wars help them to realize that they were not inferior in any way, and had a right to it. Democracy did not cause the fall of the British empire. It was part of the recovery from the fall. Turkey needs some more dose of democracy in order to get rid of the remnants of the old order. Currently the old order of the Turkish Republic is an encumbrance for Turkey. A strengthened democracy can level the power sources of the old order and pave the way for a new and much more healthy order. Only then can Turkey safely get rid of democracy. For western Europe, it is entirely a different story. Currently democracy is a parasite for western Europe and the western world in general. Democracy has no benefit to them. Far from it! Democracy benefits from them. It does so by exploiting them, yes, by exploiting them! Democracy is not for people, but people are for democracy, people are slaves of democracy. But they cannot see that! They cannot see that because democracy allures them. It allures them with its pompous words and cunning false promises. People of the western world should awake before they lose their personality and dignity, and in the end, their lands! Oh that, I discarded it as being almost useless as only the pure form is quoted for almost all of it. Easily distorted by local expansions. I mean, the frequency is highest and the same (1.3%)for P287 in Sicily and Iran, this is clearly meaningless. "Another point: southeastern Turkey is traditionally called Kurdistan". "The National Geographic Society places haplogroup G origins in the Middle East 30,000 years ago"
"But clearly, it survived some place at very small numbers compared to other sons of F"
"To me, the most likely place of origin is the NW subcontinent - parts of Pakistan with a moderate climate and sufficient rainfall throughout many tens of thousands of years". Much of the region included within 'eastern Anatolia, Armenia or western Iran' were presumably equally as desirable as habitat. And the article seems to suggest that no basal G haplogroups can be placed anywhere near Pakistan. "Finally, the beginning of agriculture was an opportunity for this haplogroup to expand further into Europe via the Balkans, and also perhaps via the Caucasus, and also led to renewed expansion eastward". Ani, I just think one needs to distinguish between where G originated, and where it first expanded. The latter clearly appears to be the Armenian highlands - I agree with you, although it also spread to other parts of the southern and western Black Sea shores and Anatolia in general probably rather soon, given the overall diversity and occurrence of deeply rooted branches, there. This paper estimates the oldest G subgroups M285, P287 and P15 at around 16,000 to 20,000 years old placed at some LGM refugia. However, any time you have a major diversification like this timed at LGM, it is much more likely that the split occurred in better times before LGM. Neither the Iranian plateau nor the Armenian Highlands were great places to live during LGM (due to dryness and low temperatures), and G itself is obviously yet older. The supplement itself mentions Pakistan as a possibility. F is clearly from the subcontinent, so it is not far-fetched to believe that one branch of it migrated via Pakistan and Iran to the Armenian Highlands. But not during LGM - much more likely before then. Oh, and I am not going to honor apo's fascist rant with a response. When Kurds in Turkey and elsewhere talk about "Northern Kurdistan", they generally refer to every region of Turkey that is majority Kurdish demographically today or since at least the Ottoman times, and this includes the majority of the Armenian Highland part of Turkey in all versions. In my post you quoted I was referring to that fact and explaining the historical background. For what is now southeastern Turkey, the parts of Turkey east of the Euphrates and south of Lake Van, on the other hand, the situation is different, as that region was not part of the Byzantine Empire on the eve of the Seljuq conquests except Edessa (=Urfa), which had been very recently (around the year 1031 CE) acquired by the Byzantine Empire from its Muslim Arab governors and so is not an exception at all. What is now southeastern Turkey has been ethnically and religiously very heterogeneous all along its history, Armenians, Kurds (including proto-Kurdish groups), Assyrians all lived there side by side for thousands of years, and in more ancient times, other now-linguistically-extinct peoples. That region has been called Kurdistan and has been part of the Greater Kurdistan for a very long time, so it deserves that name. But the Armenian Highland should not be called Kurdistan, that would be ahistorical. "I just think one needs to distinguish between where G originated, and where it first expanded". True, but they could quite often be the same place. Any expansion may simply have been delayed by unfavourable environmental conditions. "Neither the Iranian plateau nor the Armenian Highlands were great places to live during LGM (due to dryness and low temperatures), and G itself is obviously yet older". Perhaps also true, but we can tell from the very delayed expansion from time of origin that G was confined to a small region where it underwent considrable drift. Such a level of drift is extremely unlikely to have occurred as members of the haplogroup moved around. Drift occurrs (quite possibly 'only occurrs') in a single, small, geographically isolated population. Therefore G is unlikely to have originated in Pakistan inspite of F being 'clearly from the subcontinent'. G doesn't look to have left any early descendants there, a situation unlikely to occurr if that region had been a great place to live during LGM. "so it is not far-fetched to believe that one branch of it migrated via Pakistan and Iran to the Armenian Highlands. But not during LGM - much more likely before then". To me the evidence to fit much better that G was left behind in Iran or the armenian Highlands when the remainder of F migrated to Pakistan, especially when we consider that F3 is not South Asian either. I understand your hypothesis of a northern migration route, but don't think it is viable. At any rate, you need to distinguish between autosomal and non-autosomal drift. The former happens easily in small groups, the latter requires large groups and famine/contractions and/or migration. It's not that G magically appeared in NW India or Pakistan and then migrated west; much more likely some F* very early on did this at an opportune time, but had changing fortunes that may have led to such expansions and contractions on the way, and close to the eventual home. Y-DNA needs occasionally large population numbers for so many mutations to occur as G shows, versus F*. IMO this happened before LGM, and since I don't believe current age estimates are better than a factor 2 or 3 off target, way before LGM (also look at C4 and K* in Australia - likely >50, 000 years old, for comparison). There clearly were sufficient climatic fluctuations between 50,000 ya and LGM to cause this in the general region between Armenia/NW Iran and Pakistan. Maybe the population weathered LGM along the middle/lower Aras river. "much more likely some F* very early on did this at an opportune time, but had changing fortunes that may have led to such expansions and contractions on the way, and close to the eventual home". Periodic expansions and contractions almost certainly have occurred. However you are actually suggesting that they would make it impossible to place any haplogroup's origin anywhere. It would then become possible to postulate any region of origin for almost any haplogroup. Besides which any such periodic expansions and contractions would almost certainly leave several discontinuous distributions, as the contractions would be unlikely to eliminate all the population in all regions except one. In other words if G, or one of its post-F ancestors, had lived anywhere other than in the Armenian Highlands (or nearby) we would expect to Find remnant populations containing descendants of such haplogroups. "Y-DNA needs occasionally large population numbers for so many mutations to occur as G shows, versus F*. IMO this happened before LGM"
I'd agree that such mutations must have happened before the LGM, but it is not true that Y-DNA needs a large population for so many mutations to have occurred in the line. A long period of drift acting on a relatively small, isolated population is a much more likely explanation. In a large population a diverse array of haplogroups is likely to arise, not a single haplogroup with multiple mutations. "and since I don't believe current age estimates are better than a factor 2 or 3 off target, way before LGM (also look at C4 and K* in Australia - likely >50, 000 years old, for comparison)". Age estimates are of no consequence here. We're simply looking at phylogeny. I agree that C4 in Australia must be at least 50,000 years old but I'd be less certain that K* is necessarily as old as that. To me it looks like a later arrival (perhaps not much later) in Australia and New Guinea. "There clearly were sufficient climatic fluctuations between 50,000 ya and LGM to cause this in the general region between Armenia/NW Iran and Pakistan. Maybe the population weathered LGM along the middle/lower Aras river". The population could just as easily have weathered the fluctuations along the Tigris or Euphrates as well. However you are actually suggesting that they would make it impossible to place any haplogroup's origin anywhere. It would then become possible to postulate any region of origin for almost any haplogroup. Besides which any such periodic expansions and contractions would almost certainly leave several discontinuous distributions, as the contractions would be unlikely to eliminate all the population in all regions except one. In other words if G, or one of its post-F ancestors, had lived anywhere other than in the Armenian Highlands (or nearby) we would expect to Find remnant populations containing descendants of such haplogroups. No, Terry. Firstly, such expansions and contractions can be, and in extremely diverse regions likely are, at first very limited, geographically. Secondly, we know many examples of haplogroups for which all but one or two lines, and often even the progenitor, were eliminated - it appears rather common (e.g., no IJK nor IJ found to date; there are few basal I and J lineages, K is predominantly Australia/ Oceania; IJ is North-Central Europe/ Southwest Asia, respectively --- with pretty much nothing in between). A long period of drift acting on a relatively small, isolated population is a much more likely explanation. Autosomal? Yes. Not for y-DNA. "Firstly, such expansions and contractions can be, and in extremely diverse regions likely are, at first very limited, geographically". And therefore not moving a haplogroup far from its origin. "Secondly, we know many examples of haplogroups for which all but one or two lines, and often even the progenitor, were eliminated"
Very many. Most haplogroups have a string of mutations from their 'origin' haplogroup to their diversification. But such a string of mutations is far more likely to develop in a population confined to a single region rather than in one migrating any substantial distance. "it appears rather common (e.g., no IJK nor IJ found to date; there are few basal I and J lineages, K is predominantly Australia/ Oceania; IJ is North-Central Europe/ Southwest Asia, respectively". The sequential development of the IJK haplogroups greatly supports the origin of the haplogroup in pretty much the region postulated here for G's origin. IJ was the earliest haplogroup that formed from IJK. Even though no IJK or IJ has been found in the region both I and J are basically found only nearby: I in North-Central Europe and J in Southwest Asia. Presumably IJ and, before that, IJK developed somewhere between Central Europe and Southwest Asia.
" --- with pretty much nothing in between"
I have trouble accepting that claim. For a start the next IJK haplogroup in the sequence was LT. This haplogroup looks very likely to have developed somewhere in South Asia, quite possibly in the northwest (Indus?). K1 is also an India haplogroup, although rare. Those haplogroups fill in the gap between South Asia and SE Asia/Melanesia quite nicely. In fact the most parsimonious conclusion is that the sequence of IJK's breakup very much supports a west to east movement through South Asia from SW Asia to SE Asia. "Autosomal? Yes. Not for y-DNA". Most geneticists accept that each individual gene has its own evolutionary history. The individual genes move through populations, often grouped together of course. In this context haploid genes would obey the same rules, therefore any distinction between autosomal and haploid genes is artificial. Individual haploid genes would be drifted out in the same way as individual autosomal genes would be. "Not along the then dry Euphrates; the very upper reaches of the Tigris is a (small) possibility - but it is tiny and extremely isolated compared to the Southern Caspian Basin and periodic climatic expansions along the Aras river"
Thanks for the link. Very interesting. I'm certainly prepared to accept the Aras as the region of origin for G, and perhaps IJK and F3 as well. But the region is not 'South Asia'. "The results of the present study suggest that, during the LGM, climates suitable for forest vegetation existed in six regions of western Asia: Colchis, western Anatolia, western Taurus, the upper reaches of the Tigris River, Levant and the southern Caspian basin." So six regions of possible human survival. "Our study suggests that, in all potential refugia, shown in Figure 4B, suitable climates existed during the LGM for temperate forest species, and this pattern provides a plausible explanation for their current distributions." "Throughout the Caucasus and western Asia, a large refugium with a suitable climate was concentrated along the southern and eastern Black Sea coast (Colchis), and smaller refugia occurred in ... [the other regions mentioned above]"
Colchis looks like the most desirable location for humans during the LGM. Perhaps G originated there? Or IJ?